Supported by Ipswich Borough Council, Kerseys and Woolverstone Wish are organising a Guinness World Record Attempt for the largest gathering of fairies in the Town Centre (Cornhill) as part of the annual Ipswich Arts Festival. The record currently stands at 786 at an event organised by Anna’s Hope (UK) at Burghley Park In Stamford UK on the 19 August 2012. We want to SMASH this record. 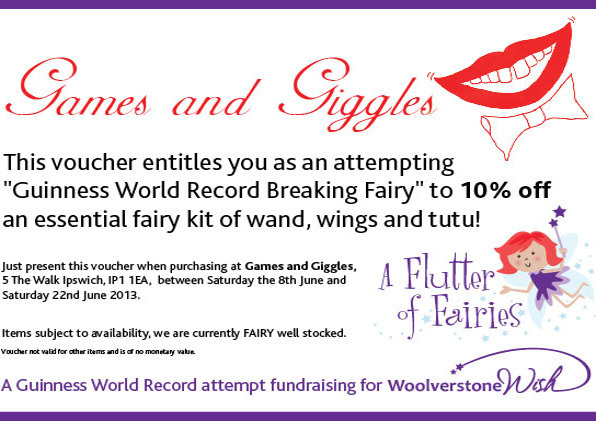 To be counted as a fairy each world record participant must wear wings, wand an tutu as a minimum. The record attempt is to take place at Midday and at 2.00pm there will be a free open air showing of the 2003 film Peter Pan starring Jason Isaacs. Click on the picture below to download and print off the voucher.